Calpine’s modification of PJM’s energy price formation proposal emerged Wednesday as the first choice members will consider at Thursday’s Markets and Reliability Committee meeting. In a series of votes that capped the 23rd meeting of the Energy Price Formation Senior Task Force (EPFSTF) on Wednesday, Calpine’s proposal won 73% support, besting PJM’s own proposal, which was supported by 57%. Almost three-quarters of voters also said they preferred Calpine’s proposal to the status quo. The rule changes would affect shortage pricing, reserve products, synchronized reserves, secondary reserves and the alignment of the day-ahead and real-time reserve markets. PJM’s proposal would replace the current stepped operating reserve demand curve (ORDC) with a sloped curve; the first horizontal segment would represent the minimum reserve requirement, with the downward sloping curve based on the probability of reserves falling below the minimum reserve requirement (PBMRR) in real time based on uncertainties. The RTO would increase the price for the initial horizontal segment of the curve to $2,000/MWh and replace the second step of the curve with a downward sloping segment valued at $2,000 times the PBMRR. Calpine supports the PJM proposal except that it would eliminate the RTO’s proposed transitional mechanism for the energy and ancillary services (E&AS) revenue offset used in the capacity market. 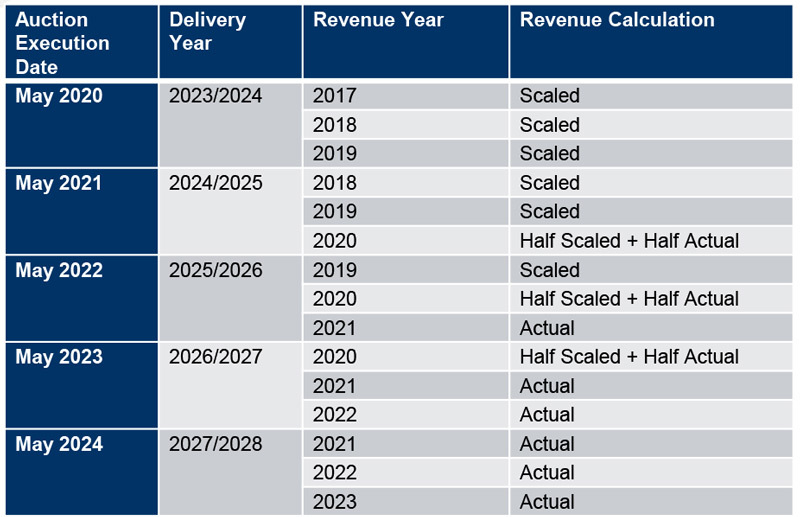 PJM proposed the transition to reflect expected changes in revenues under the changes; as E&AS revenue increases, the net cost of new entry goes down. Before the vote, PJM’s Adam Keech explained the RTO’s transition plan. Assuming FERC approval is received in the first quarter of 2020, PJM would implement the revised curve on June 1, 2020, with an $850/MWh penalty factor and move to a $2,000/MWh penalty factor starting June 1, 2023, for the 2023/24 delivery year. Keech said PJM would simulate energy and reserve market outcomes based on actual operating conditions and use the results to adjust the E&AS offset. The simulations would be used to “scale” the revenues used to determine the offset, Keech said. More than 230 task force members cast votes on the proposals. The D.C. Office of the People’s Counsel proposed a similar ORDC to PJM but would treat the impact of the regulation requirement differently. It received only 5% support. The Independent Market Monitor won 19% support for a proposal that would leave the ORDC unchanged and reduce the current two-step penalty factor ($850 and $300) with a single penalty factor equaling the safety net energy offer cap of $1,000/MWh. If PJM approves a cost-based offer above that price, the penalty factor could increase in $250/MWh increments to a maximum of $2,000/MWh. Despite its seeming strength in Wednesday’s task force vote — which allowed members with multiple affiliates to cast multiple votes — Calpine’s proposal is no shoo-in. At Thursday’s MRC meeting, the voting will be subject to sector weighting, with no affiliate voting and a two-thirds threshold required for approval. If the Calpine proposal fails to win the required supermajority, PJM’s proposal will be considered next. The Monitor and OPC proposals also could be considered if the preceding proposals fail. The Members Committee is also expected to vote on the issue Thursday. The Calpine and PJM proposals are likely to face opposition from at least some load interests. Gregory Carmean, executive director of the Organization of PJM States Inc. (OPSI), complained that PJM had not provided enough information on the impact of the proposed changes on prices. Keech said PJM ran two simulations and that the data has been available since September. “It would have been great if that desire [for additional data] was provided earlier,” he said. “Since the very beginning, OPSI has been very clear that we wanted to see the cost impact of those proposals before we determine whether they are just and reasonable,” Carmean responded. In a letter to the Board of Managers on Wednesday, OPSI asked PJM to delay action until stakeholders have time to evaluate additional data. The board told members last month that it will make a unilateral filing with FERC if they do not reach consensus on a package by Jan. 31. Under current market rules, PJM says, inflexible generators such as coal, nuclear and large gas units are not permitted to set price. As a result, RTO officials say, LMPs do not accurately reflect the true cost to serve load when those units are running. Inflexible units are those with declining average costs that are unable to economically produce power output within a certain range or have an economic minimum output that exceeds the amount of energy needed from the unit, PJM says. The issue, which had been masked by upward pressure on prices from rising demand and the higher costs of marginal units, is now more urgent because low fuel prices and more efficient units have resulted in a generation mix that is less differentiated by cost and more by physical operational attributes, the RTO says. It contends flexible units will benefit because the rule changes will eliminate a source of price suppression. After months of debate on proposed definitions for operating parameters, PJM and the Independent Market Monitor rankled some Market Implementation Committee members last week by introducing an unexpected, last-minute compromise package. PJM has dropped a plan that would have allowed dispatchers to cut interchange ramp limits in order to reduce price volatility and uplift.